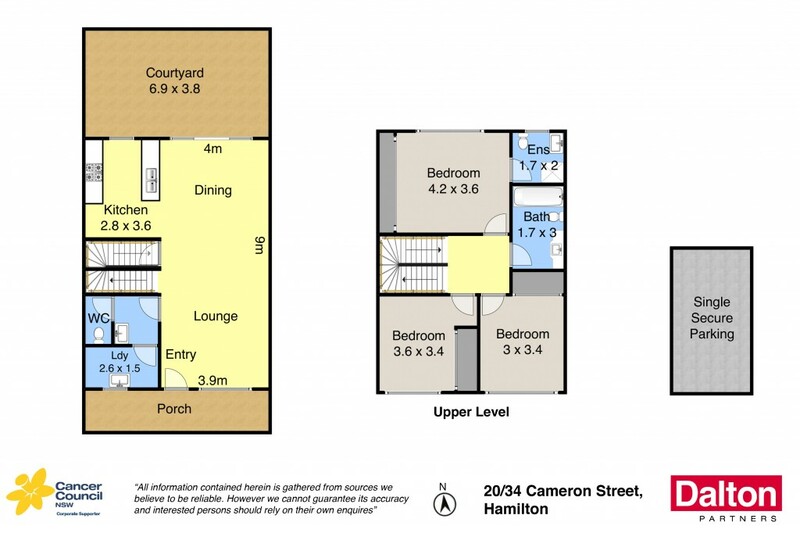 Situated in one of Newcastle's most vibrant communities, this spacious, dual level townhouse is modern in design and nestled in a desirable, tightly held, security complex. With open-plan, free flowing interiors and a private courtyard capturing a majestic northern aspect, it unites sought-after space with peerless convenience to Beaumont Street's village shops, popular cafes, restaurants and transport links. Three robed bedrooms, two bathrooms and a secure carpark reinforces the appeal of living this relaxed lifestyle for young families, executives or investors. * Open plan living flows through to outdoor courtyard. * Modern kitchen with stainless-steel appliances. * Master bedroom boasts a private ensuite. * Two further bedrooms access a stylish family bathroom. * Single garage; ducted air conditioning; downstairs WC. * Enviable lifestyle location, stroll to shops, cafes and parks. * Holds great appeal for a wide range of buyers. Council Rates: $1,150 PA approx. Water Rates: $605 +Usage PA approx. Strata Levies: $2,072 PA approx.